What’s messier right now—my bedroom or my computer’s desktop? How and why did it get to that state? I cannot blame any of my desktop mess on the Blogging 101 class. Quite the contrary. I took the course to help me sort out my priorities and maybe use some of the articles I started and never finished—all saved to my desktop over a period of about a year. I have been known to procrastinate, but do not usually. I don’t remember ever being bored. Daphne Gray-Grant talks about the benefits of sacrificing our amusements in exchange for creativity we might discover in boredom. There is always so much I want to do–not trivial things either. I have no TV, that’s right–not even one. People with ADHD are not bored (my self-diagnosis). What is the definition of ADHD? It is a disorder that causes a person to…Look, there goes a bunny rabbit! Someone says, “Good news—another hour has just been added to every 24-hour day! How would I use those extra sixty minutes? What if I had one more hour every day to catch up with the projects I have planned or promised to finish? Would I actually use that hour to bring my “to-do” list under control? “My days are swifter than a weaver’s shuttle” (Job 7:6) sounds more and more understandable to me, especially since I know this is my last week before our big move. One day at a time we make decisions about how we’ll use the life the Lord has loaned us. And one day at a time we review how those hours have been used. Introspection is a painful but necessary duty. That is a great idea! It would seem to solve my present clutter, but I did that about 6 months ago and saved the folder in my documents as VIP. Now am I going to do it again? 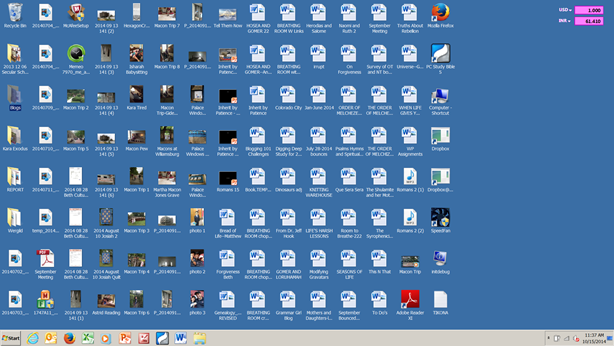 No doubt some of those beastly documents and photos crawled out of VIP folder onto my desktop again and have had babies. LOL I need that extra hour a day to tame them. So much to do, so little time–how do we choose? Lately, I have been borrowing from Peter (housework, homeschooling) to pay Paul (blogging, spending time with college kids). May you make wise choices this week, my friend. I need big-time help to get my priorities right. There is so much good to be done and so little time. Our children need emails from me too, and I definitely need to hear from them. I also try to think of the legacy I am leaving. Can our children be comforted or encouraged to follow my example? Am I a good example? Right back to the title, “…thus are the secrets of his heart made manifest…” (1 Cor. 14:25, KJV).